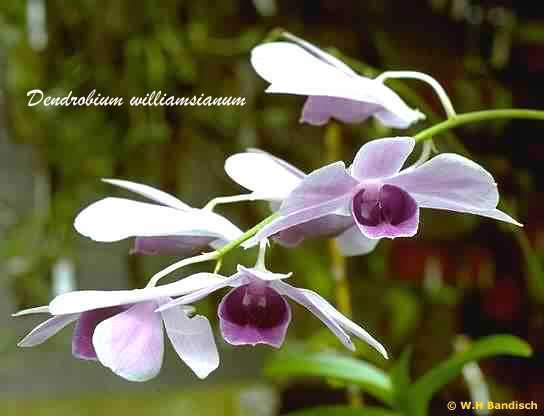 Dendrobium is a diverse genus of orchids with different cultural needs. Many go through a growth phase and a rest phase during the course of one year, and must be given water and temperature to match these growth and rest periods. Flowers can last one day to many weeks, depending on the type. Light: Strong light is important, especially when growth is maturing. Give bright light; some sun. In the home; an east, shaded south, or west window. In the greenhouse, 25% to 50% full sun. Less light is needed when plants are resting. Temperature: Temperature needs vary widely. It is best to follow the plants' natural requirements. Provide night temperatures of 45 to 60 degrees; and days of 65 to 95 degrees. Water: When plants are growing, water just when becoming dry. Some types need severe drying while resting. Mist in home in the morning if air is dry. A humidity of 40% to 60% is optimum. Fertilizer: Must be provided on a regular basis since potting media have little. In active plant growth, apply 30-10-10 at recommended rates. Reduce fertilizer when growth is completed. A bloom booster may encourage flowering. More frequent fertilizing is good under high temperature and light conditions. For Dendrobiums, it is important to not fertilize while resting. It's really tough to give general cultural requirements since Dens vary to such extreemes. It might be worth considering having a few Den culture threads. I'd like to see one specifically for the very commonly found hybrid types specifically the antelope-phal-type hybrids that you can get at any DIY store. Then perhaps another on the soft-cane or nobile-type, perhaps others as well. For Dendrobiums, I highly recommend the culture sheets created by Baker & Baker. And by far the best and cheapest way to get them for Dendrobiums, about a thousand different species, is to buy their book on Dendrobiums. I bought mine from an internet used book dealer. You should be able to get the book used for about $60. It is large format (~8.5" x 11") and is a good 2" thick. http://www.orchidculture.com/ The climate table alone is worth the price of the sheet. Check out their free sheets to see what they typically contain. I agree with a separate basic culture sheets for dens, especially for the nobile type. I killed my first nobile because I didn't know it needed to rest & have very little water over the winter. Jerry Meola also has some interesting posts on the Yamamoto nobile dens. Like you and others have said before, important to know what type of dendrobium you need to care for. Do the hard cane dendrobium species require winter rest? I have a lot of keikis that almost have no roots, and winter is coming so I'm afraid that they will die during winter! Are the keikei's still on the mother plant or have you potted them up? Keikeis are small, so they wont need alot of moisture. If you've got them potted up, just make sure there in some light bark/orchid compost mix. Keep them fairly tightly potted, and water as the medium gets very dry, every couple of weeks. Aleska, They won't die during the winter, they will continue to be nourished by the "mother" plant. Just yeaterday I saw a hardcane species, Den kingianum, with multiple keikis, many of which were in spike, and not a root on any of them. I should point out it is spring here (Australia) now and these keikis all made it through our winter without any problem. Just leave them all as they are and they'll be fine. Unfortunately, they are not attached to the mother. I have removed them from the mother and placed in moss because they almost have no roots. Because of that I'm afraid that they won't survive winter... I thought to bring them in to the house and let them grow without dormant period so they can make more roots and new shots. My hard cane keikis were growing this summer, and in autumn they stopped. Now I noticed that leaves on those growths are turning yellow? I don't know what caused that? cuthbertsonii and laevifolium should be put into the same temp range. They are only about 5 F different in temps according to Baker, but I think it it that extra 5 degree difference that makes cuthbersonii difficult to grow. I am growing laevifolium in intermediate conditions quite successfully. Hmmm, I did a double take on canaliculatum too. I have this high and dry right now. Seems Baker's notes would indicate some very dry rest for it. Warm and pretty dry. Please help me identify when a dendrobium is resting. Does one cut back the canes after the flowers fall off? Thanks for the great info. Does one cut off or remove the stalks after blooming is completed? rwilliams: After the flowers are done, you may cut off the flower spike itself, but not the cane it grew from. Even if the canes have no leaves, they will provide energy to your den. Depending on the species, leafless canes can also produce additional spikes in the future. Plus I personally think its the leafless canes that really intrigue me and give them character. It-s summer here and my nobile-type dendrobium is growing new growths. I know that now I should increase watering, but I don't know should I still let it dry between waterings? How do you water your nobile dens in summer? During the summer, I try to not let them completely get bone dry. If you have new canes growing in, roots are soon to come and you don't want them to get too dry either. Newbie here and would like to know several things. I have two dendrobiums in bloom and they are exposed to full sunlight from morning to 1 p.m.
1.So far good but will the same cane flower again after it dries up? 2.How often should i water it? 3.The small keikis (if i'm not mistaken) is emerging from the mothercane and is there any special treatment for it? 4.And also should i mist it's leaves everyday? 5.What are the things i should do for the plant to flower again? 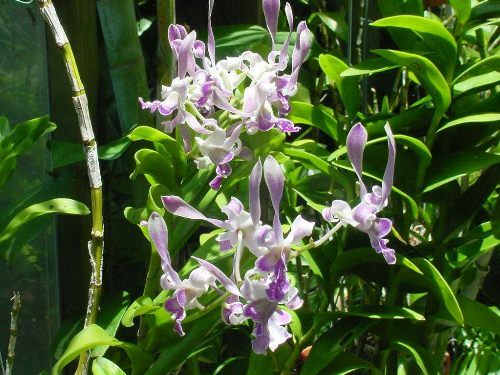 The most common types of dendrobium are: phalaenopsis-type dendrobium (or phal-type for short), antelope dendrobium, and nobile-type dendrobium. There are others, but these are the 3 most commonly grown in the US. If you live in Australia, all three of these will be out done by Australian native dendrobiums. This type gets its name because the hybrids are made using species from the Phalaenanthe Section of the genus. The plants can be large or small, the canes when mature have leaves on only about the upper 1/2 to 2/3 of the cane. Flower spikes appear mostly from the top of the cane. This type of den is used in the cut flower trade and the vast majority of cut-flower dendrobiums will be this type. This type of phal is extensively hybridized so the diversity of the flowers is incredible. This type gets its name from the petals of the species which stand up and twist, resembling an antelope's horn. They are not easy to tell apart form the phal-types when not in flower, especially since there has been a lot fo breeding of phal-types with antelope types producing hybrids like Dendrobium Easter Bunny. Generally though many have slightly smaller leaves than the phal-type, more slender canes, and leaves up and down most of the length of the cane. They flower from approximately the upper 1/4 of the cane. Nobile type hybrids are so named because they contain the species Den nobile. This type is easy to identify in flower because it will have many flowers on very short stems up and down the length of the cane. When not in flower they are distinct form the previously described types in that their canes are quite a bit fatter, especially in the middle and thinner at the base and end. They have leaves nearly the entire length of the cane. Nobile type dens are deciduous and usually one or 2 years after it is a mature a cane will loose all of its leaves so it is not uncommon to see bare canes on this type of den. It's perfectly normal and expected. Also, many nobile type canes have a slitly zig-zag appearance as if each leaf is pulling the cane slightly out of being perfectly straight. Returning to the flowers, they are generally very showy and often frilly. 1) one of the leaves is turning real yellow, was one of the reasons I decided to save it. Is it cool to remove the leaf of should I wait till it dries out on it's own? 2) It's currently in bloom will removing the leaf impact growth? 3) There are three canes with a fourth small node growing in the bottom appears to be a new cane, any experience with this? The roots seem fairly happy and in good condition! Since it's blooming should I increase watering or is every 7 days a good gage, the room stays a constant 65% humidity and 60 - 65 at nite up to 70 during day? Thanks for your thoughts! Much appreciated! Ok, so here's a silly newbie question...how does one tell if the den. is in active growth or resting cycles? I have one that's currently blooming- blooms every year in March and the blooms last for weeks! How do I know when to add fertilizer to the water or just water? I just recently got a blooming nobile dendrobium (yamamoto) and i need help! One of the leave has died and some of the other leaves are getting yellow and one of them has black spots, the den is still in bloom what am i doing wrong? What do i do? They pretty much get light from morning till about 1pm. am i exposing it to too much light? not watering enough? what do i do about the leaves? HELP! how should I best care for it? if I do everything right, when should I hope to see new growth? I know it needs high light, but how warm should I keep it? If it's a phal-type den check out the culture sheet at AOS | Members Only Area, that will tell you how to care for it. You should see new growth in the spring. I have 2 dendrobiums that I bought not too long ago. I think they are the antelope-type because the flower has those upward-twisting petals that you talk about, and the lip is thick and kind of hairy. The flowers are light green on one, and on the other one hey are more brown/yellowish. So, the flower spikes have already died off. should I cut them off? Can I care for them the same way I do my Phals? I let the medium dry out between waterings, right now I am doing every 2 days because the temps are running about 30C. And I use a weak mixture of fertilizer once a week. So, the flower spikes have already died off. should I cut them off? You could. If you leave then they'll dry up and turn brown. Can I care for them the same way I do my Phals? I let the medium dry out between waterings, right now I am doing every 2 days because the temps are running about 30C. And I use a weak mixture of fertilizer once a week. No you can not care for then the same as for your phals. 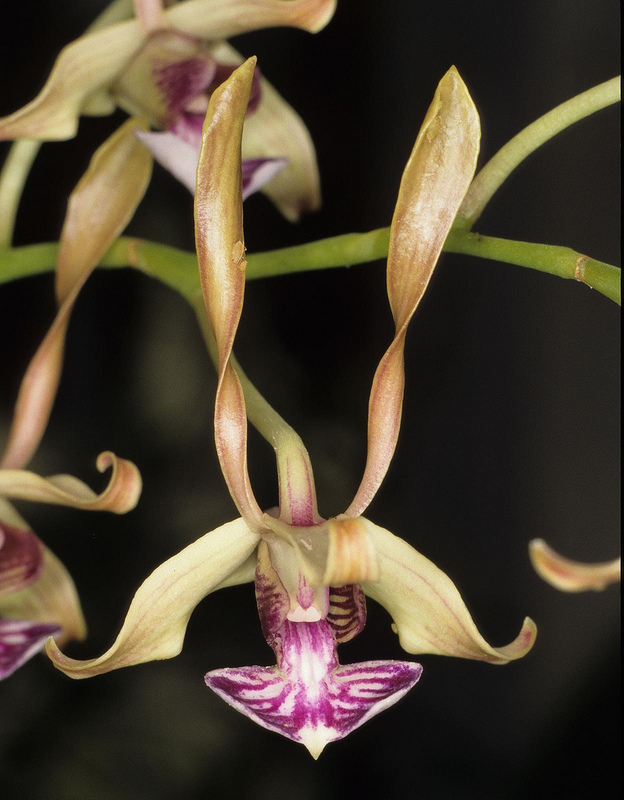 Is the care you describe the care oyu give your dendrobium, your phals, or both? The care you describe sounds ok for your dendrobium, but not your phals. phals need to stay slightly moist. If you're letting them dry out, that's not good. Get yourself good culture sheets on both dens and phals. Go to AOS | Members Only Area or look n the orchid care section of this forum. Read the culture sheets and let us know if you have any questions. Thanks for the post Kmarch! I let my Phals dry out between waterings because that's what I have read many times in this blog. I try to keep moist aliflor in a tray underneath my plants so the air will be humid for them but I do let the medium in their pots dry out a bit between waterings and so far I have had good results. Ok, well drying out "a bit" and letting it "dry out" are two different things. It's find to let a phal dry out a bit so as not to stay soggy, the mix in the center fo the pot will likely still be a bit damp. What you want to avoid is letting the phal dry out completely like you would for a cattleya. ok, thanks for the explanation! I am watering more since you told me this info, maybe I was being a little too extreme with my girls. I am just always scared of stem rot because I recently had a case of it myself! With the Dendrobium Gracillimum, would you treat it like a Dendrobium speciosum during winter? Or should i keep them undercover like the other Australian Dendrobiums with thin canes? According to Baker & Baker, Den x gracillimum (note capitalization) is a natural hybrid between D. gracilicaule and D. speciosum. You can find culture notes for the species parents in the Baker and Baker book. Sorry Kevin, i still have troubles finding the Baker and Baker book. 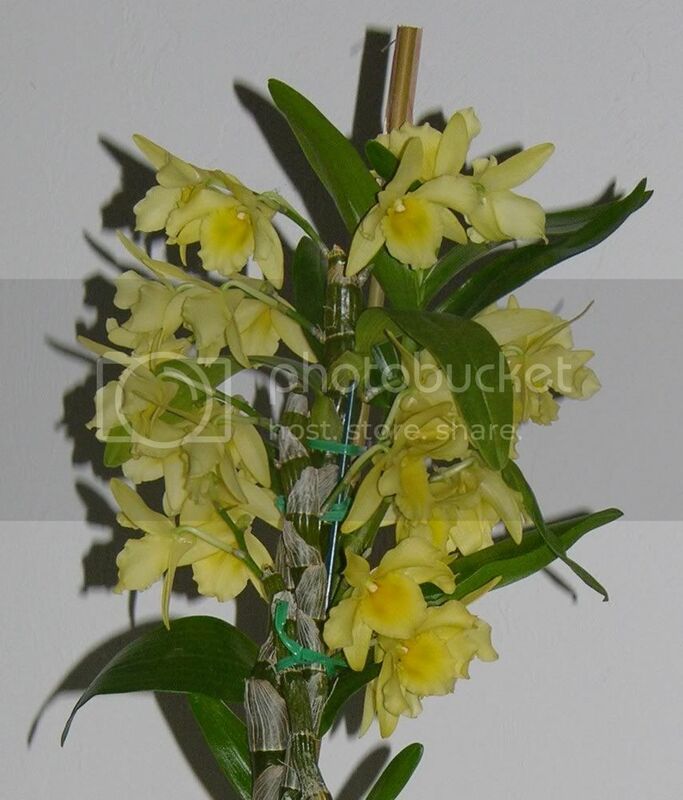 I cant seem to find much info on the net regarding this Dendrobium. The paperback price on Amazon is less than I paid for mine. Hope it's okay to resurrect this to ask a rather general question, rather than make a whole new thread. Would most dendrobiums be okay with being moved to a lower-light area (think about four feet from a filtered south window) while they are in bloom, in order for the grower to better appreciate them? I know that my Phals don't mind at all, but have never tried it with a higher-light-loving alliance. I think it probably would, depending on what kind they are. Some dendrobium flowers are more delicate than others. In question is a hybrid made by H&R that has bloomed for the first time- Den. Mini Stripes. It's primarily Den. bigibbum, affine, and phalaenopsis. It's primarily Den. bigibbum, affine, and phalaenopsis. Den phalaenopsis is a synonym for bigibbum and Den affine is in the same complex so it sounds like it's a Phalaenanthe type hybrid. Those flowers generally hold up fairly well in varying conditions, most of the dens bred for the cut flower trade are of this type. I'd be surprised if you had problems with moving it to enjoy the flowers. Suhweet. Thanks for the input! I was unaware that the taxonomists had lumped bigibbum and phalaenopsis together. So hard to keep up with nowadays. I was unaware that the taxonomists had lumped bigibbum and phalaenopsis together. It's not that they've lumped two different species together, it's rather the opposite, that the one species had been described using 2 different names. The code of nomenclature doesn't allow for that. One name had to stand and the other had to become the synonym. The name Den bigibbum is the one that stood. That makes much more sense, thanks! I have den harveyanum and den species stratiotes. Do both of these require winter rest? I have a couple of Dendrobium (Honohono) keikis, (actually two spikes with two on each) brought to me by a friend in Hawaii about 3 weeks ago. Though he grows them professionally for leis, he doesn't know much about them, so the roots on them were not mature enough. I planted one spike in a coco bark/New Zealand Spaghnum mix. It is doing incredibly well, with new leaves and roots getting stronger. The other spike has been struggling. The two keikis seem to be maintaining, tho I think its a roll of the dice as to whether they will survive. One has a new "node" (not a root) at it's base which is tiny, but there. I have these mounted to palm bark between two layers of moist Spaghnum, like a sandwich. Weather is warm here in So. Cal, so they get misted frequently during the day. Bottom line, is that I'm not sure if what I'm doing is really the best way to get them up and running. Any comment would be appreciated. Haven't dealt with this kind of problem before. Last edited by PaulB; 07-27-2011 at 06:13 PM. If it is working then it must be ok. Keep doing what you're doing if the plants are doing well. 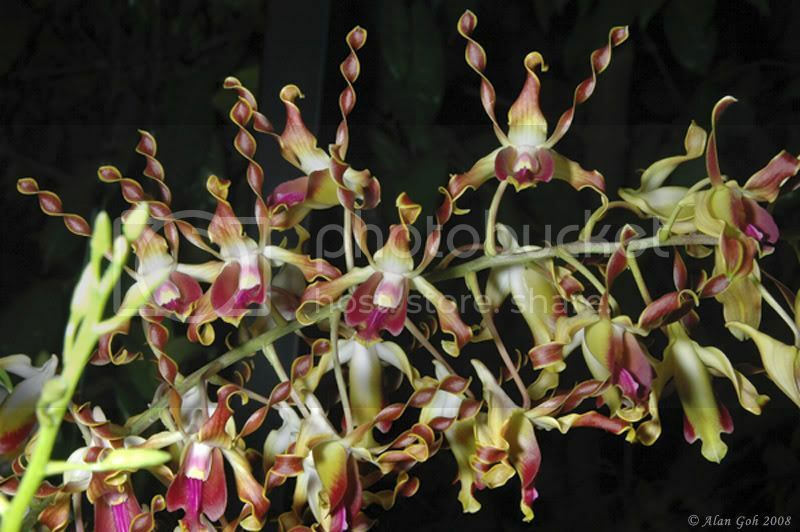 You've probably got noid phal-type dendrobium hybrids as that is usually what they use to make leis. Thanks for the response! Actually, after I wrote the questions I went and checked on them. My feeling, was that they may be getting too much moisture and not enough air flowing around them. Lifting away the Spaghnum, I found a new root on one and the little "node" is actually a new plant. tiny, but there and getting bigger. Question: do you recommend any kind of feeding at this point? They are at least growing now, but it may be too early to feed. BTW; its a Den. Anosmum - Hono hono. Incredible color! Oh if it is a Den anosum then it's not the kind they use in leis although Den anosum (not capitalization - species names are not capitalized) is very common and veyr popular in Hawai'i because it is so easy to grow there. I'm not much on fertilizing to begin with but I think I'd wait a little bit before fertilizing just to make sure you have roots that are mature enough an I'd also start with pretty weak fert to avoid any kind of fert burn. When Is A Good Time to Divide Dendrobium? Hi kmarch, i have learnt so much from all your replies to the myriad questions posted in this tread. I now know that my den is a phal-type. I have a very matured phal-type den (canes are approx. 1 foot in height ) that i got from my parents recently. it has past its blooming period. is this a good time to divide? there are 2 leaveless canes and another 2 canes with few leaves left on them. i've never done any division before so do i simply cut between the canes? your advice would be most appreciated. I would not divide if it only has 4 canes. I recommend a minimum of 3 canes per division. Others recommend as many as 5. So you'll need to grow 2-6 more new canes before dividing. In my opinion the best time to divide is after the plant has flowered but before it starts it's new growth cycle. I have a couple of Den nobile type orchids, some are in pots but I have mounted one on tree fern with a bit of Sphag moss for moisture retention. Which is the preferred method? Kmarch, Dendrobium kingianum is known in South Africa as the Australian rock orchid. Do you know in which part of Australia it occurs naturally? I have 1 plant but kept it a little too dry during last winter! It's outside under shade cloth and recovering nicely. What's a good growing medium? When I bought mine it was in sand and gravel which had packed hard. Essentially whatever works... it will really depend on the conditions you keep them in. I believe it is found right down the east coast. Den. kingianum does not need a winter rest... keep watering right throughout the year. I have mine potted in a coarse pine bark (1-2cm chunks) but any open mix is fine. With the seasons the way they are in Australia, is the resting season Summer or Winter for Dens? They generally put out new growth in late spring and summer after flowering but the pseudobulbs grow and mature throughout the year... at least for the large majority. I don't usually see new growth produced in the colder months but the plants do not stop growing completely as some other Dens do. My Den Kingianum has keikis. Should I wait and see if it gets spikes before removing and planting them? I wouldn't want to lose out on flowers. When is a good time to remove keikis and plant them? When they have a decent set of roots preferably with canes about 10cm long. You can usually just twist them off fairly easily.